If you are looking for information on the Scooters Coffeehouse franchise business opportunity, Scooters Coffee House franchises or Scooters Coffee franchising, then you have come to the right place. Welcome to Scooter's Coffeehouse. Here we have a passion for coffee and a commitment to make every experience exceptional. With an extraordinary array of premium blends and an uncompromising brewing philosophy, Scooter's has carved out a unique position in the specialty coffee market. We don't just sell coffee, we love it, and you can taste the difference in every cup. Our mission is to be the leading franchise company in the Specialty Coffee Industry by providing premium products, premium customer service, and premium presentation one customer at a time. Established in 1998, Scooter's Coffeehouse has quickly distinguished itself as one of the premiere franchises in the exploding specialty coffee industry. Since we began franchising in 2001, we've experienced rapid growth, with more than 70 locations now open or in development throughout the United States. Along the way we've received numerous awards and accolades, including Best Coffee in Wyandotte County (Kansas, 2006), Best of the Bluffs (Iowa, 2005, 2006, 2007, 2008), Best of Omaha (2002, 2003, 2004, 2005, 2006, 2007, 2008), and in 2007 we were honored to receive the Omaha Chamber of Commerce's Emerging Business of the Year award. It surprises many people to learn that coffee is the single most traded agricultural commodity in the world, or that every day more than 32 million Americans enjoy a specialty coffee drink from their favorite shop. In 2005 specialty coffee was an $11 billion retail business in the United States, and the market continues to experience significant growth. The insatiable demand for specialty coffee is a relatively young phenomenon in the U.S., and given the astonishing numbers, it is no surprise that few business ventures are as exciting or attractive to entrepreneurs. With revenues climbing and markets expanding, opportunity is at its peak. In a vibrant market, differentiation is the key to success. At Scooter's we have developed a singular "premium" identity that sets our coffeehouses apart from the competitors and allows us to occupy a unique position in the industry. Our dedication to the premium experience has created a difference that customers appreciate. Our coffee tastes different because it is different. Our premium coffee is roasted to perfection by our own experienced roastmasters who understand and uphold our standard of perfection. Our whole beans are carefully maintained for freshness so customers can be sure they're taking home the same rich flavors they find in our shops. To ensure that every distinct blend meets Scooter's premium standard, our blends are cupped by Scooter's employees before they hit our menus. Our baristas do not rely on automation technology. Like the old-world masters, they are trained to understand grinding, brewing, and what it takes to create the perfect espresso. The premium experience begins with our coffee, but it doesn't end there. Our corporate philosophy dictates that everything the customers taste, see, hear and feel should reinforce the premium philosophy. Our specialty drinks are created with Monin syrups, widely recognized as the world's premier flavoring. Unlike many popular flavorings, Monin syrups are made from natural fruits, nuts and spices, and contain no fat or cholesterol. Our mocha drinks are blended with Monin premium chocolate syrups, a rich and superior alternative to powdered flavorings. 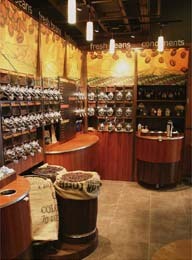 Our store locations are aesthetically designed to emphasize the premium experience. Equipment, art, furniture and accessories are carefully designed to reinforce the message that our customers receive the best. This unique identity has turned Scooter's into the largest locally-owned coffee franchise in the Midwest. From the very beginning, Scooter's has provided a true premium experience. Now, we are taking that experience to the rest of the nation, providing opportunities to share in the same success that has become a hallmark of the Scooter's brand. One of the many benefits of joining the Scooter's family is the powerful and proven support system we've established for our entrepreneurs. Franchise owners are the cornerstone our business. Strong, entrepreneurial individuals who come from all walks of life, our owners are hands-on individuals who directly operate their own franchise. They take pride in building their business and serving the fresh premium products for which Scooter's is known and loved. With support from Area Developers and the corporate support staff, our owners work daily to position Scooter's as the national leader in the specialty coffee industry. Our role is to give them the tools and knowledge to do just that. Watching each franchise succeed is the most exciting part of our growth, and we bring the same level of commitment to our franchisees that we've always brought to our customers. The Scooter's success story is filled with inspirational people doing remarkable things. In just nine years, Scooter's Coffeehouse has grown from a single location in Bellevue, Nebraska into a respected national chain with more than 60 locations open or in development. Along the way we've been voted Best of the Bluffs (Iowa, 2006), Best of Omaha (2002, 2003, 2004, 2005, 2006, 2007), and this year we were honored to receive the Omaha Chamber of Commerce's Emerging Business of the Year award. Success has followed us into the national market, and the continued dedication of our franchisees is what makes it all possible.